British songwriters Tony Waddington and Wayne Bickerton began writing fifties style doo-wop songs in the early seventies but had problems finding people to record them. Many of the existing acts and glam bands at the time didn’t seem to want to know, so they assembled their own group to do the job. They called them the Rubettes and charted three hits that they’d written. They then went on to write hits for Mac And Katie Kissoon, but they weren’t the first songwriters to have this problem, it happened in America 10 years earlier. In 1963 the producer and A&R man at Chess records, Abner Spector (who has no relation to Phil), asked his friend Zelma Sanders to write a song for a girl group. Zelma (known as Zell) eventually teamed up with Abner’s wife Lona Stevens to write a song from an idea that Lona had which was based on the 1881 nursery rhyme Ring Around The Rosie as it was known Stateside and Ring a Ring o’ Roses in the UK, and called It Sally Go Round The Roses. Artie was also responsible for the unique arrangement. According to Marc Eliot’s book Rockonomics, Artie said, “The song was not the greatest, but I heard something in it and asked Abner if he minded me going into the studio and making a demo of it. He agreed and so I went to the Broadway Recording Studio’s and initially laid down an organ track then added a drum track. I put another colour on it and basically I went another generation. This was well before the days of 24-track studios so the sound seemed to get worse with every generation I added somehow getting better in its ‘worseness’, but when I finished the record it had a definite sound.” He later claimed that he never got paid for his work but at least it gave him his first credit as an arranger. The British and American releases differ very slightly; the American version has a seven second intro whereas the British version is 14 seconds long. Once the members of a group were finalised, they needed a name. Zell once owned her own J&S record label in New York specialising in doo-wop, so decided to take the J and add it to the beginning of Lezli’s middle name which was Anetta and thus coming up with The Jaynettes. In addition to those already mentioned, other vocalists on the track included Selena Healey, Marie Hood, Marlene Mack, Louise Harris Murray, who had been an original member of the Hearts and Iggy Williams. According to Richardson, “Anybody that came in the studio that week, Spector allowed them to sing on the track. Originally, I think he had about 20 voices on there. 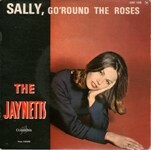 The single’s success led to an album which was titled Sally Go ‘Round the Roses and not only included the single, but an instrumental version of it as well and the follow up single, Keep An Eye On Her which failed to make the Hot 100, as did the next two singles Snowman, Snowman Sweet Potato Nose and There’s No Love At All thus rendering them a one-hit-wonder. In the mid sixties and long after the group disbanded, a new version of the Jaynettes was formed keeping only Richardson from the original line-up but adding Evangeline Jenkins, Linda Jenkins and Georgette Malone. They released a few singles, some with bizarre titles like Chicken, Chicken, Cranny Crow which had the equally silly Winky Dinky on the B-side, Peepin’ In And Out the Window and Who Stole the Cookie but maybe the public, by then, were looking for something more sensible as they all failed to make an impact. Lezli went on to record for the disco label All Platinum and recorded the original version of Love on a Two Way Street which was an American hit for the Moments, and later became a backing singer for Eddie Kendricks. In the 1990s she retired from music and started working for an alcohol Beverage Control company and after that become a stenographer under then-New York Governor Nelson Rockefeller. Hood went on to work for the Postal Service, Murray married Donald Gatling and they began recording as a duo under the name Two Hearts. Mack had a solo singing career and briefly became Peaches when she stood in for Francine Barker in Peaches and Herb. As for Sanders and her daughter, they both sadly died young, Zell in 1976 at the age of 54 and Johnnie in 1988 from a stroke aged 53.